There is an old saying used by high school football coaches all across America – “If you play great on Friday nights, then you can play on Saturdays. If you play great on Saturdays then you can play on Sundays.” This phrase first came into vogue when high school football was played on Friday nights, college football was played on Saturday and the NFL was strictly a Sunday sport. This is a really, really old saying. NFL teams trimmed their rosters down to 53 players on Saturday. Some big names were handed pink slips, including quarterbacks Tim Tebow and Matt Cassel, wide receiver Reggie Wayne and defensive back Stanley Jean-Baptiste. Do you want to be in the U.S. Senate when you grow up? It wouldn’t hurt to attend an Ivy League school. Do you want to be an NFL player? Then take your talents to the Bayou because LSU leads the NFL with 38 former student-athletes currently on team rosters. Nearly all of the 2015 NCAA champions are represented on NFL’s rosters. Twenty-six players in the NFL used to wear the scarlet and gray of Ohio State. FCS champ North Dakota State has six players on NFL rosters, while Division II champion Colorado State-Pueblo has two former players and Jake Kumerow from Division III champion Whitewater-Wisconsin was the only Warhawk in the NFL ranks. He did not make the 53-man squad, but did sign on to the Cincinnati Bengals practice squad. Michigan State, Oregon State, USC and Virginia Tech are in a four-way tie with three quarterbacks each on NFL rosters. Oregon leads the ground game with five running backs on NFL rosters. How about those big guys protecting the signal-callers and opening holes for backs – they most likely attended Alabama. The Crimson Tide leads the league with eight players who put their hands in the dirt. If you are looking for players to go across the middle, you need to grab some men who played in The U. There are six former Canes burning up the hot routes at wide receiver in the NFL. If you are looking for someone to cover those wide receivers, it wouldn’t hurt to have a player from LSU in your defensive backfield – those Cajun cats lead the league with nine players each. LSU also has 10 defensive linemen on NFL squads while Texas and USC steal the title on Linebacker U away from Penn State with eight former Trojans and Longhorns dotting NFL rosters and while the men from Happy Valley are tied with the Dawgs from Athens, Georgia with seven each. 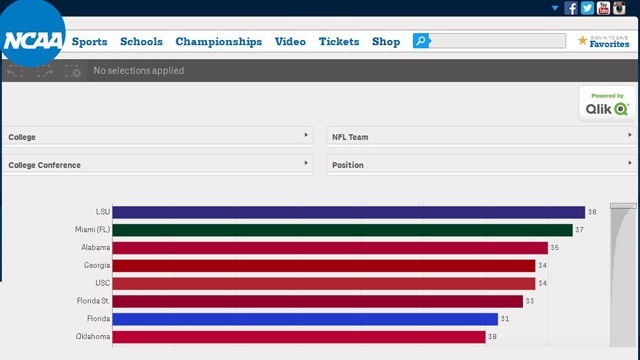 There are two NFL schools that both feature seven players from the same school. The city most likely to have a Seminoles backers club is Buffalo as seven former Florida State players call themselves Bills. And the least-surprising group of alumni belongs in the city of Brotherly Love. This might surprise no one, but Chip Kelly has assembled six Oregon Ducks on the Eagles’ roster. Now it is your turn – jump into the numbers and see what crazy combination you can come up with – looking for the team that has the most punters from the Big Ten? The answers are waiting for you. What Power Five conference produced the most offensive linemen? Dig in and find out.